The Alhambra viewed from the east. The Alhambra is a fortress enclosed by a wall, containing palaces, houses, streets, and towers of various sizes and unctions. It is a city unique in its design, chronology, and present condition. The Sultan lived in the palace complex, making the Alhambra the kingdom’s seat of government throughout the rule of the Nasrid dynasty (1238-1492). The Alhambra, the palace complex of the Nasrid dynasty in Granada, can perhaps be considered as one of the most famous examples of Islamic art overall, but is certainly the culmination and grand finale of medieval Islamic culture on the Iberian Peninsula. Our idea of the Alhambra is defined by the buildings of its apogee in the 14th century, which were constructed at the same time as York Minster, Cologne and Milan Cathedrals, the Strasbourg Cathedral, Westminster Abbey, the Pope’s Palace at Avignon, the Signorie of Florence and the town halls of Bruges and Prague. The palace complex of the Alhambra viewed from the hill of the Albaicin. The history of the Alhambra building complex, however, stretches right back in Islamic times to the 9th century. We first learn of the existence of the “Red Fort” (for that is what al-hamra means) around 860, though nothing remains of this today. The earliest buildings of the Alhambra that can be dated are from the 11 th century, from the time of the Zirid dynasty, under which a forerunner of the Alcazaba came into being. The present area of the Alhambra, with its wall and its earliest towers in position, began to take shape under the Nasrids, the last Islamic sultanate on the Iberian Peninsula, in the first few decades of the 13th century. The dynasty had made the southern Spanish city of Granada the capital of its kingdom. For a long time, the sultanate was able to exist alongside the Christian rules by means of a skillful policy of treaties, vassalage, and military campaigns, while at the same time being adept at furthering its own cultural development. Construction of the Generalife, a summer palace near the Alhambra that underwent many alterations by subsequent sultans, probably started at the beginning of Nasrid rule. At the beginning of the 14th century, Muhammad III (1302-1309) contributed to the infrastructure of the city center, the Medina, with the construction of the mosque, the adjoining baths, the rauda (the sultans mausoleum), and the Puerta del Vino (“Wine Gate”), where the main street, the Calle Real, left the city. The actual palace area of the Nasrids was first developed under Ismail I (1314—1325). There are still significant remains of his palace, hidden among the palaces of the second half of the 14th century. The middle of the 14th century saw the sultanates most fertile period under Yusuf I (1333—1354). He built the Palacio de Comares (“Comares Palace”), the city gates of the Puerta de la Justicia (“Gate of Justice”) and the Puerta de los Siete Suelos (“Gate of the Seven Stories”), and, among other things, the wonderful Torre de la Cautiva (“Tower of the Captives”). The golden age of the Nasrid dynasty was undoubtedly that of Muhammad V in his second reign (1362-1391). The Riyad Palace also known as the Patio or Palacio de los Leones (“Court of the Lions” or “Palace of the Lions”) — owes its existence to him. In terms of architecture and wall decoration, this is one of the masterpieces of Islamic culture. The present appearance of the Alhambra is the work of Muhammad V, for it was in his reign that buildings were decorated and many more were erected. During the 15th century, the sultans time was increasingly taken up with the advancing Christian armies rather than artistic creativity. As a result, this was a period of decline, with no significant construction work and with no innovation in terms of building ornamentation. Before that, however, Muhammad VII (1392—1408) built the Torre de las Infantas (“Towers of the Infantas”) on the city wall, and Yusuf III (1408—1417) made alterations to the Generalife and built his own palace in the part of the palace area called the “Partal.” When the Christians captured the city at the end of the 15 th century, they reinforced the city wall and the major gateways with circular bastions, so that they could better withstand an artillery attack. The Christian governors made alterations primarily to the houses and the urban structure, adapting them to their own requirements. These works also affected the palaces, as the Patio de la Reja and the Patio de Lindaraja illustrate. The Palace of Charles V, a jewel of the European Renaissance, is the 16th century’s major contribution to the Alhambra, and represents a counterpoint to the Moorish buildings. Planned in 1526 as an imperial palace on the Alhambra, it was never actually completed. The Convento de San Francisco (“Monastery of St. Francis”), the beautiful Charles V fountain at the Puerta de la Justicia, and the Puerta de las Granadas (“Pomegranate Gate”) on the ascent to the palace complex, are also Renaissance contributions to the Alhambra. In 1576, the Friday Mosque was demolished and replaced by the Church of S. Marfa de la Alhambra, which was completed in 1617. From a geographically favorable position on a high plateau, the Alhambra kept watch over the kingdoms capital city situated at its feet. It acted as the administrative and power center of Granada and as such is in line with the typical Islamic palace complex containing the sultans residence and seat of government. It developed following the municipal architectural ideas of medieval Islamic culture. It was laid out as an independent fortified town, separate from Granada, its medina and suburbs, with a city wall approximately 1,900 yards (1,730 meters) long, which had about 30 towers, varying in size and function. Granada and the Alhambra were two cities that complemented each other, but were autonomous, and their sole point of direct contact was at the Puerta de las Armas (“Arms Gate”). This gateway, which was situated between the Albaidn — the town district on the hill opposite the Alhambra — and the lower city, represented the most important connection between the two. Through it the subjects entered the palace complex to seek an audience with the court, to sort out administrative matters, to pay dues, or to undertake other such tasks. Gradually, and especially after the last few decades of the 15th century, the population of Granada increased considerably due to the arrival of Muslim refugees from other cities conquered by the Christian armies. This created a new town area with its own walls, which in the end almost surrounded the Alhambra. Puerta de la Justicia. Built in 1348 by Sultan Yusuf I, the Gate of Justice is the largest of the Alhambra’s four outer gates. A hand is carved in the keystone of the outer horseshoe arch, which, like the key in the inner arch, is one of the symbols used by the Nasrids in facade decoration. The large foundation inscription is above the entrance, to which, in the 16th century, the Christian kings added a statue of the Virgin Mary by Roberto Aleman. The vaults inside the gate, which has to negotiate a great difference in height are lavishly painted. The Wine Gate was one of the first gates erected in the inner area of the Alhambra. Built between 1303 and 1309, it was the entrance to the Medina, the area of town within the fortress where the administrative and court officials lived. The Puerta del Vino had a dual protective function, in that its strong doors could be locked to protect against attack from enemies outside the city and also if the inhabitants of the Medina rose up against the sultan. Despite its function as a fortification, the gate looks like a public pavilion. The city wall of the Alhambra has four large gateways at roughly equal intervals – two to the north and two to the south – that served to defend the city. The Puerta de las Armas was one of the first gates to be built, probably one of the very first buildings built by the Nasrids in the Alhambra in the 13th century. The gateway exhibits a distinctive feature of Spanish-Islamic fortress construction: the passageway is not straight, but is deflected once or twice for more effective defense, thus making it more difficult to lay siege to the city and easier to establish a firm, defensible position. In addition to the elegant structure and successful proportions, the simple, yet beautiful portal of the Puerta de las Armas also merits attention. A pointed Moorish archway, the top of which is decorated with a frieze of interlacing bands with different colored luster inlay, is surrounded by a rectangular frame (alfiz) with guilloche ornament. The arch imposts are made of stone, a building material that, unlike tiles and stamped clay, was hardly used in the Alhambra, with the exception of the outer gates. In the passageway, a series of three rooms in the middle has a reflective vault and umbrella domes on the sides. The plaster on this type of vault is painted to imitate a red brick wall, typical of Nasrid architectural decoration. Niches with benches for the sentries are found on the sides and at the back of the passageway. At the eastern continuation of the wall lies the Puerta del Arrabal (“Suburban Gate”) below the Torre de los Picos (“Points* Tower”), which owes its name to the remains of the battlements. The stone gateway leads to a sunken path used by the sultan and his escorts on their way to the ornamental and kitchen gardens of the Generalife on the other side. On the southern flank of the city wall to the east is the Puerta de los Siete Suelos, which was probably built in the mid- 14th century. It was close to the Medina of the Alhambra, and chronicles state that jousting tournaments and military parades were held in front of it, so that it had a certain ceremonial character. When Napoleons armies retreated in 1812, it was almost totally destroyed, but it was possible to reconstruct it fairly reliably from old engravings of the gate. The final outer gate of the Alhambra is the large Puerta de la Justicia, which the foundation inscription above the entrance arch dates to the year 1348. The key carved into the keystone is an iconographic symbol often found on Nasrid gates, just like the hand in the large outer arch that provides such a magnificent frame for this entrance. The passage to the interior of the gate is interrupted repeatedly, and the rooms have the obligatory benches for the sentries. Again, the paintings on the various vaults imitate ordinary red brickwork. Within the city walls, the Alhambra extends over an area of about 26 acres (10.5 hectares) It lies about 2,300 feet (700 meters) above sea level on a foothill of the Sierra Nevada called Sabika, which extends into the fertile Vega. In medieval times, the agriculture and cattle farming of the Vega were, and in some cases still are, important economic pillars of the town. The builders did not alter the landscape in order to erect the city’s buildings, for they were constructed without the need for major earth moving and were adapted to, and sometimes cleverly exploited, the differences in height and the irregularities of the terrain. The palace complex comprised three sectors that, although protected by a shared city wall, had independent functions. One was a citadel, or barracks area, reserved for an elite troop whose task it was to be on constant guard over the whole complex and who were always ready to leap quickly and effectively into action any time and any place. Another was a palace area, the residential apartments of the sultan and his close family, where the daily life of the court unfolded. And finally, there was the Medina, a small town for court and administrative officials, and for artisans who were meant to meet the sultans immediate wishes. These three parts of the town were linked by a complex system of streets and gateways, but could at the same time also be cut off from each other if the safety of the ruler so required. Streets and gateways thus had an ambivalent function. Under normal circumstances, they made it possible to pass from one part of the town to another; in the event of a siege or of an uprising, however, the gates could be shut, thus transforming the streets into securely blocked, and barely accessible, sections. Unlike the outer gates, these gates were straight, and were closed from the inside by means of large wooden doors. The best example of the construction of such an inner gateway is the Puerta del Vino, which leads from the outer entrances to the Medina. Built at the turn of the 14th century, its facades were decorated at various times. The western facade was made of sandstone, and the symbolic key typical of a portal adorns the top of the arch. The decoration of the eastern portal — the cuerda seca tiles framing the archway and the stucco panels to both sides of the window in the upper story — dates from the second half of the 14th century. From the terrace of the Torre de la Vela, there is a fine view over the inner area of the Alcazaba. The remains of the foundation walls still give an impression of this small quarter, which contained the homes and barracks of the guard. Depending on size, the two-story houses had one to three rooms on each floor. The public facilities included a steam bath, cistern, and communal kitchen. As you would expect for a military district, there were also prisons – underground rooms accessible only by ladders or ropes. This chamber was altered repeatedly over time and was in fact the first throne room in the palace of Sultan Ismail I. When the palaces were extended, from the 1330s onwards, it became the reception and meeting hall of the Nasrid court. It was particularly suitable for this function because of its rich tile and stucco decoration. After the Christian conquest, a chapel was installed here. Opposite the Puerta del Vino, towers and walls majestically enclose one of the three areas of the Alhambra: the citadel, or Alcazaba. It looked like a separate small town within the royal city and had accommodation for an admittedly small, but elite, contingent of specialized soldiers. This was where the permanent guard for the whole complex lived, and from here the sentries swooped down to their positions on the battlements of the city wall and at the inner gates. Like all military establishments, the Alcazaba was also built at a strategically favorable position from which the lower town and its surrounding area could be observed and controlled. It actually lies on a long, protruding spur from the Alhambra hill. A long, narrow street divides the inner Alcazaba into two zones. To the north, irregularly arranged remains of walls and brick floors give an indication of ten houses of varying size but similar construction in the guards’ quarters They are in keeping with the typical layout of Spanish-Islamic houses. As with fortress construction, there is the typical entrance area with its many protrusions, which in this case protects the privacy of the inhabitants from prying eyes, and there is a small patio that always has a water feature in the middle. This can be a small bubble fountain, a stone trough, or a small basin set in the ground, known as an alberca. Depending on the size of the house, one to three ground floor rooms open onto the patio, from which narrow steps lead to the upper story. Hidden in a corner, each house had its own toilet complete with flushing cistern. As can be clearly seen, the entrance to the houses opened out directly onto the street, to secondary alleys or to passageways. To the south of the main street, the remaining walls indicate houses with similar features, but more uniformly and regularly distributed. This was where storehouses and probably communal accommodation for young sentries were found. Other buildings complete the urban area of the Alcazaba: a steam bath as an established integral part of Spanish-Islamic towns, a cistern to ensure the water supply, and a communal kitchen where food prepared at home was cooked. Of course, no military district would be complete without its dungeons, the mazmorras, which were notorious under the Christians. After working all day as agricultural or manual laborers, at night the prisoners were lowered down into subterranean dome-shaped rooms, similar in cross section to a bell. Inside, they were usually divided into small sleeping areas by brick walls radiating from the center. These caverns could also be used as silos, i.e. as stores for wheat, spices, or tools. The dungeons were of fundamental importance, especially in the last few years of Nasrid rule, the prisoners had a considerable exchange value since during the ten-year war with Castile, particularly if they belonged to the upper echelons of the Christian army, or even to the royal family. The most important prisoners were probably accommodated in the dungeons of the Alcazab, literally under the feet of the elite troops. The Alhambra is dominated by a large building, square in outline, that can be seen from afar and that seems to be a focal point: the Torre de la Vela (“Guard Tower”). In the ground beneath the tower there is a silo, above which rise four stories, although the connecting stairway from the Nasrid period no longer survives. The impressive roof terrace of the tower, which originally had battlements, offers perhaps the best view of the city of Granada. There in a wall is the famous bell that, after the Christian conquest, set the rhythm of life in the town and the surrounding area and which for centuries sounded the alarm. The bell was also rung at particular times during the day and night and on important days of remembrance, such as the “Day of Conquest,” which commemorated the towns surrender to Christian troops on January 2, 1492. The largest tower of the Alhambra, however, is the Torre del Homanaje (“Tribute Tower”), which was probably one of the first buildings erected by the Nasrids in the 13th century. This probably accommodated the military staff who directed and controlled the Alhambra’s defense system from this elevated point. The tower s five floors display a wide variety of vaults. An additional storage bin on the ground floor of the tower and a terrace with a small podium are also worth noting. From here, visual signals could be exchanged with the fortresses and watchtowers which occupied geographically strategic positions in the mountains around Granada. The Alhambra is held in such high esteem primarily because of the Comares Palace and the Palace of the Lions, both dating from the 14th century. Since the 16th century, these two buildings together have been called the Casa Real Vieja (“Old Royal Palace”), to distinguish them from the large Renaissance palace of Emperor Charles V, the Casa Real Nueva (“New Royal Palace”), built at that time. The Catholic Monarchs retained the medieval Nasrid palaces as private residences to enjoy their magnificent decor and as they stipulated in their will, “so that they may never be forgotten.” Although partly altered in shape, neglected, sacked, and left to the mercy of nature over the centuries, most of their structure and decoration have survived. In all the domestic architecture of the Spanish-Islamic culture, including the palaces, the plain exterior is in stark contrast with the interior patio around which the rooms are arranged. When you enter the patio, all your senses are captured by a profusion of colors, scents, light, and imagination. The roots of this dynamic probably lie in the jaima, the nomads’ desert tent and cradle of Arab civilization. There the inhabitants gathered on the narrowest space around the open circle in the middle. Around this main tent, more tents were pitched in no apparent order, thus producing a camp. On a different scale, this principle underlies towns, houses, and even the palaces of the Alhambra: buildings were added on or overlapped each other as long as there was sufficient space within the walls. Main facade of the Comares Palace.In 1370, Muhammad V commissioned the decoration of the Comares Palace facade, which faced the Cuarto Dorado.The door to the right gave access to the private apartments of the palace, while the ones to the left led to the official halls of the Comares complex. An inscription over the doorways reading “My gateway is a fork in the ways” summarizes this arrangement. A projecting roof that used to be painted in bright colors deserves special mention, as it is a gem of Islamic carpentry. The administrative function of the palaces can be seen from the way they are divided into rooms. This design began with a series of courtyards, grouped in hierarchical order, and restricting the movements from courtyard to courtyard of those with access. It culminated in the Sala del Mexuar, where the Council of Viziers would take the important decisions for the kingdom, and which was the Alhambra’s first throne room, probably at the beginning of the 14th century. After the Christian conquest, it was used as a chapel. The various decorative styles express power and supremacy and must have instilled awe in anyone entering the room. The colored tiled panels which also adorn other courts and halls, are a recurrent motif. In front of this impressive background, the sultan of the 14th century would grant his subjects an audience. Behind this zone of officialdom, the imposing Comares facade forms a boundary between the semipublic administrative area and the private residential area, although this boundary was in general flexible. The facade, built in 1370, epitomizes the ornamentation of the Nasrids of Granada superbly: geometry, inscriptions and ornamental foliage (ataurique) are carved into the stucco panels of the facade, dividing it into harmonious proportions. It is crowned with a projecting roof, a masterpiece of the carpenters’ art in the Alhambra. This facade signified a high point in the development of building decoration. Although the glowing colors have now almost totally disappeared, its majestic character is still clearly apparent. On the steps in front of the facade, which gave him an air of authority, the sultan sat, as though before an imaginary royal canopy, and administered justice to his subjects. Behind this splendor lies first a dark, winding corridor leading to the dazzling side wing of the patio, now called the Court of the Myrdes. Its focal point is formed by a long pool, which becomes an essential architectural element, as the surrounding buildings are reflected in the tranquil surface of the water, thus producing an impression of spaciousness. On the narrow sides of the patio, water flows from two fountains, and drains away through small overflows in the corners. The water is circulated in such a way as to produce a water surface that is as smooth as a mirror, called “the sea” by Arab poets. There, where the myrde bushes now stand, some of the water was led off into the long flower beds, originally sunk lower, on the long sides of the pool, thus serving as irrigation: a complex and beautiful water system. This courtyard arrangement is typical of Nasrid architecture, with the buildings always arranged around an inner courtyard with a water source at its center, thus setting the proportions of the building s ground plan and elevation. Court of the Myrtles in the Comares Palace. The Comares Palace, built under Yusuf I, is in line with typical Nasrid building design, with all the important rooms arranged around a splendid inner courtyard. The residential apartments are on the long sides of the Court of the Myrtles, while at each narrow end a portico leads onto the public reception and administrative halls. In the background rises the Torre de Comares, the highest tower of the Alhambra, which houses the Throne Room. The most elegant apartments, most of which were in the northern part, were lit from the south. These rooms also occasionally open onto the north. In the Alhambra palaces, this occurred where the steep slope of the hill offered them some protection. In general, the desire for privacy and intimacy meant that the rooms did not open onto the outer walls but onto the patio, where a portico marked the beginning of the most elegant rooms, almost always situated on the narrow sides of the patio. The walls usually had a dado lavishly decorated in mosaic tiles (alicatado). Detail of the central arch of the portico on the northern side of the Court of the Myrtles. Behind the richly decorated arch of the portico you can see the beautiful muqarnas arch, immediately in front of the entrance to the throne room. It is decorated throughout in carved stucco, originally painted in many colors. The arches are purely decorative and have no supporting function. that give the court its name can be seen on both sides of the pool. The patio thus includes water, gardens, light, and heavenly vaults, and can be seen as a return to the nomad tent, shutting out the outside world — creating a feeling of ambivalence ever present in the old civilization of the crescent of Islam. This is just as true of the modest, sometimes tiny houses of the Moriscos (Moors forcibly christened after 1500) that can still be seen in the Albaicfn, as it is for the royal palaces of the Alhambra. The porticoes of the Comares Palace, with their seven great arches, have retained two further important decorative elements of Nasrid architecture: slender marble columns with delicate muqarnas capitals and, above the arches, magnificent, filigree stucco panels, carved with lozenges, known as sebka ornamentation. These pillars and panels are purely decorative and have no supporting function. Wall niche on the northern side of the Court of the Myrtles. On both sides of the portico galleries on the narrow sides of the patio are small rooms, known as albamfes. These illustrate the full range of Nasrid decorative art. Above the ceramic decorative tiling in the dado area rise muqarnas vaults and intricate polychrome plasterwork, with epigraphic borders. room and bedroom, is derived from the Arab word baraka, meaning “Happiness” and “Blessing.” The magnificent timber ceiling has strip ornamentation and intricate star-shaped designs. Some parts had to be restored after a devastating fire in 1890. Above their tiled dados, the walls are lavishly decorated with carved plasterwork, with spaces being left for wall hangings and wall carpets. the palace rooms display a large number of epigraphic embellishments, mostly poems or qasidas that refer to the place or to the sultan who commissioned the construction work. Other writings praise and glorify Allah, or quote from the Koran. 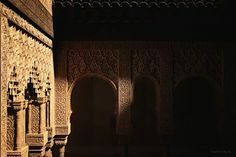 In Spanish-Islamic culture, rooms had no specific function and could be used as sitting rooms during the day and bedrooms (alcoves) at night. An example is the Sala de la Barca, which was simultaneously the sultan s sitting room and bedroom. Above the tiles and stucco slabs, splendid wall carpets or tapestries probably adorned the walls, reaching right up to the intricately worked wooden vaults, whose star motifs would originally have been gilded. The sultan here wanted for nothing. 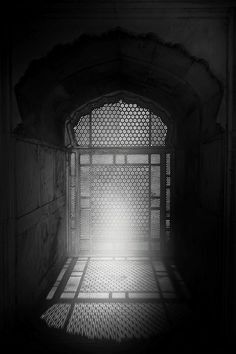 His hygiene needs were met by a toilet with running water in an adjoining room with wonderful wall pictures, and for religious duties there was a small prayer room with a prayer niche (mihrab). The one in Granada points as accurately as possible towards Mecca. Other prayer rooms that still exist today, such as those of the Mexuar, are somewhat larger. Here the open arcades on the northern side look out onto the countryside as though the architect wanted to give believers sitting on the ground reading the Koran the opportunity to contemplate the wonder of the Creation. A separate, pavilion-like building in the Partal gardens houses a third, smaller prayer room for the sultan. The most impressive room in this palace, which seems to summarize all the ideas underlying Nasrid art and architecture of the mid- 14th century, is the Comares Hall, also called the Throne Room. It looks like a gigantic cube filling the entire interior of the largest tower of the Alhambra. With the exception of the entrance wall, each side of its strong outer walls contains a small alcove, two of which are exacdy the same. The one opposite the entrance, which was reserved for the sultan, is different, and outshines the others in terms of embellishment. All the walls are richly decorated. The dado has remarkable alicatado decoration with various geometric patterns, and is topped by stucco panels with carved decoration on vertical and horizontal sheets. Everything is based on a geometric arrangement, in the context of which foliage motifs (atauriques) and inscriptions in rounded (naskht) and straight (kufi) versions develop. Close examination is required to appreciate the diversity of coloring and the intricate details displayed by the stucco work in the past, as these are now reduced to mere soft pastel tones. The ornamental high point of the chamber is, however, the roof timbering, a genuine masterpiece of Islamic carpentry. Numerous polygonal wooden panels are nailed to the timber roofing, which is propped-up on the walls and itself has no supporting function. Following geometric principles, these panels unite to form star shapes that fill the three-timbered roof areas, one after the other, finishing with a small muqarnas dome. The timbered roof is also based on the cosmic and eschatological representation of the eight heavens of the Muslim Paradise. Here, as in no other room in the palace, the sultan would appear in his full power in this life and the life to come, and be surrounded by the symbolism of lawfulness and magnificence. of the two water tanks of the actual steam bath, which is similar to the aldarium of classical warm-water baths. Although this 14th century bath, which is of great significance structurally, has undergone many changes, the most important decorative elements have survived. The Sala de las Camas (Room of Couches), is the most important room in the baths. It is named after its two spacious alcoves, situated on the sides and slightly raised behind twin arches.The room, which has no side windows, was lit from above by a lantern structure, around which the upper-story rooms are arranged. The entire area was repainted at the end of the 19th century. Tunnels for the guards run under the main rooms of the palaces. They are part of a tangle of crooked passages, corridors, and stairs, invisible from the elegant rooms, that relate to the different levels of life within the palaces. In one of these systems of passageways, at the point where the two large palaces of the Alhambra meet in the north on the city wall, there is a steam bath, an essential part of Islamic communal life. Of the several baths within the palace complex, that of the Comares Palace is the best preserved, although here, too, structural alterations have been carried out over time. Although the Christians generally found Arab baths strange, and in the 16th century even banned their use, the installations were retained as an exotic element or as evidence of a sophisticated lifestyle. Access to the royal bath was gained via the central patio of the palace, the Court of the Myrtles. There was a changing room and a toilet next to the northern portico. A narrow stairway led to the lower story and the most magnificent room of the baths, the Sala de las Camas (“Room of Couches”). This part of the baths owes its name to the two slighdy raised alcoves which are behind two twin arcades. The room is lit and ventilated by a lantern structure, a typical feature of Nasrid architecture, surrounded by a gallery of service rooms. Most of the decoration — fountains, walls, floor coverings, columns, tiles, and stucco — is original, although the stucco slabs were repaired and repainted in glowing colors in the second half of the 19th century. Next to the relaxation room is the actual steam bath, the vault of which has conical star-shaped skylights. The servants could open or close the movable glass covers from outside to regulate the amount of steam in the baths. It is the largest and warmest room, with a central, almost square-shaped section that opens onto galleries on two sides. Pipes of varying sizes run underneath the marble floors and in the walls, bringing hot air and steam from the water boilers to produce the required temperature and humidity. The last room, with its two water troughs, which could be filled with hot or cold water as desired, lies above the baths’ hypocausts. Boiler, timber store, and the servants’ entrance complete the site. The tiled dado of these rooms was disturbed in parts during renovation work carried out in the 16th century, as can be seen from the abbreviated imperial motto “Plus Ultra” on some tiles. impressive room in the Alhambra, as its interior exhibits the entire range of Nasrid decorative arts and architecture. The Palace of the Lions was built onto the Comares Palace as an independent building with its own entrance. There was no direct link between the two until Christian times. This building displays the geometry and proportions of Nasrid architecture and ornamentation of the second half of the 14th century at their peak. Here, a marble fountain at the intersection of two water channels replaces the central pool. Twelve verses carved into the outer edge use poetic imagery to praise the intricacies of its hydraulic system. They are among the most beautiful poems to be integrated into the decor of the Alhambra. Twelve lions, all slightly different and arranged male and female alternately, support the bowl and, with their many and sometimes contrasting symbols of power, courage, strength and justice, they emphasize an iconographic duality, the forerunners of which can be found in antiquity. In Islamic art, animal-shaped water dispensers are frequently around fountains, pools, aquamaniles, etc., and are used to link two aesthetic points of reference: the representation of animals, and water. The apartments are arranged around the patio, which is framed by its famous colonnade. The arcades give the effect of a portico around and directly in front of the apartments. Two ornamental pavilions with a square ground plan, situated on the narrow sides of the patio, seem to highlight the royal apartments that lie behind them. Ceiling of the Throne Room. The splendidly decorated ceiling of the Throne Room is made up of small, geometric pieces of inlaid wood that were once painted in glowing colors.They are applied in ascending order of size and form different levels that refer to the seven heavens of Islam, over which the eighth heaven, the throne of Allah, forms a dome. there are small recesses (known as taqas) to hold jars of liquid. the Comares Tower, two each of four different designs. The ninth recess opposite the entrance is the odd one out, obviously more lavishly decorated because it was reserved for the sultan. One of these apartments is the Sala de los Mocdrabes (“Muqarnas Chamber”), which is situated on the western side right by the original entrance to the palace and has the feel of an antechamber. The rectangular room opens onto the courtyard with three large muqarnas arches. It owes its name to a muqarnas vault, which has to be one of the most beautiful in the entire Alhambra. It was badly damaged when a nearby gunpowder store exploded in 1590, and was replaced by a stucco vault designed in 1614. Beneath this, only part of the original vault base on the back wall has survived, with the remains of its paintwork. 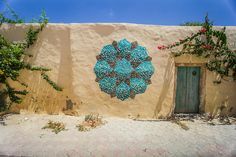 The wall decoration, which must have had a dado area with the traditional alicatado and wall carpets or stucco in the upper section, has also disappeared. The Sala de los Reyes (“Hall of the Kings”) on the eastern side of the courtyard deserves its special status. In structural terms, it is a room with no specific purpose and has five, instead of nine, alcoves at the side. It is reminiscent of the Throne Room of the Comares Palace, where a rectangular, not square, structure dominates the ground plan. Here too, alcoves — five in this case – are arranged around a multipurpose room. The alcoves also emphasize the central axis, whose dome gave the room its name. Here ten people are depicted deep in conversation. This used to be interpreted as representing the most important kings (sultans) of the Nasrid dynasty, but this has now been rejected. The two outer domes show court scenes and are of great interest in terms of iconography and design. Attitudes to depictions of living creatures have been very varied in the Islamic world, although this work is thought to have been commissioned from Christian artists, probably from the Italian city of Genoa. The distinctive features and technique of the decoration of these domes is unique in a medieval Islamic palace. They were painted in egg tempera on a ground of several layers of plaster, in which the initial sketch was chiseled out, and were varnished with wax. The ground was made of tanned sheepskins, which were stretched over the wooden roof struts and joined at the seams with small bamboo nails. Two separate residential apartments on the northern and southern sides, each arranged around a square-shaped room, complete the layout of the palace: the Sala de las Dos Hermanas (“Hall of the Two Sisters”) and the Hall of the Abencerrajes. The scale here is smaller and the decor more sumptuous, without in the least diverging from the general intimate scheme. The two rooms display the most beautiful muqarnas domes. Based on a geometric plan and working outwards from a star motif in the center of the dome, colored stucco prisms were jointed together and mounted on top and underneath each other to form concentric circles. Both residential apartments are slighdy elevated from the patio and each open onto it — exactly at the coordinate axes — through a large, rounded arch. They can be shut off with timber doors, decorated with geometric arrangements of richly carved panels. In the upper floor, there are also rooms, which look out over the rooftops like small pavilions. On the garden side, the great Mirador de Lindaraja lies direcdy in front of the Hall of the Two Sisters. This is an elegant area of the apartment, where the palaces finest decor is to be found: small-tiled alicatado dadoes, a twin window, and the stucco decoration that surrounds it, as well as the unique small roofing pieces, made of timber latticework inlaid with colored glass. The fountain in the Court of the Lions. Even in the 14th century, a complex hydraulic system provided sufficient water pressure and a constant water level in the fountain. The 12 lions, from whose jaws the water flows down, symbolize all 12 signs of the zodiac and thus the entirety of time, eternity. Verses written by the vizier and poet Ibn Zamrak adorn the dodecagonal rim of the fountain. Capital of columns in the Court of the Lions. The slender marble columns of the galleries that surround the courtyard are particularly impressive. The symmetrical, cube-shaped capitals, with their moldings decorated with inscriptions praising the architect Sultan Muhammad V, deserve particular attention. The portal pavilion in the Court of the Lions. The geometric design of the architecture of the Court of the Lions is particularly emphasized by the two square-shaped pavilions that project into the east and west axis of the courtyard.The architecture of the Alhambra is distinctive for the ephemeral nature of the materials used: as most of the columns and arches are purely decorative and have no supporting function, they could be made of soft stone and plaster. The masterly arrangement of projections and recesses, the modulation of exterior surfaces, and the gradation of richly decorated muqarnas arches help to create the particular aesthetic effects of the Alhambra with the play of light and shadow. The palace buildings of the Alhambra open only hesitantly to the outside, to the city below, and onto the river valley, and seem to want to climb over the city wall. The Palacio del Partal(“Portico Palace”), provides a graphic example of this. It was probably built in the first part of the 14th century and thus represents the oldest palace architecture on the site. The front part of a patio house, the Torre de las Damas (“Ladies’ Tower”), whose roofing can be admired in the Museum for Islamic Art in Berlin, has survived as part of the city wall. The arcades of this portico, which gave the palace its name, project from this section. In front of it is the usual, elongated pool. These set pieces are now surrounded by luscious gardens. Until practically the end of the 19th century, this sector of the Alhambra was divided up into small, private plots that were gradually acquired by the local authority to group the land into a memorial complex. During several decades of archeological research, walls, floor coverings, and albercas came to light, giving an idea of the original layout of the town. Visitors today will be able to see them in the context of later gardens laid out in the soil terraces (paratas) that date back to the time of the Nasrids. These stretch up the slope from the wall to the Medina. Hall of the Kings. The Sala de los Reyes is an elongated chamber, divided into several rooms by a series of muqarnas arches. The alcoves in the back wall give an unrestricted view onto the courtyard. The three alcoves that open onto the Sala de los Reyes have vaults that are among the Alhambra’s most important decorative treasures. Within the Palace of the Lions, there are various, separate residential areas. One of these is the Sala de Dos Hermanas,the Hall of the Two Sisters, which opens onto the Court of the Lions. The architecture and decor of this hall are particularly impressive. Perhaps the most surprising element of this section of the building is the splendid muqarnas dome that rises over the entire central part of the room. It is made of plaster and is based on a central star motif, developed by overlaying individual, multicolored prisms at different levels. The hall derives its name from the two large marble slabs (the sisters) on the floor by the central fountain. Ceiling decoration in the portico gallery of the Partal Palace. Portico galleries, either between the open courtyard and the most important, roofed residential areas or separating them from each other, are a distinctive feature of the The Medina architecture of the Alhambra palaces. The interior of the galleries is usually decorated with timber constructions assembled in a geometric pattern, as illustrated by the colonnade of the Palacio del Partal. The Medina, which rises gently from west to east, was a proper little town in its own right, set apart, to maintain and supply the palace. Its main artery was the Calle Real. It had public baths, a mosque, and stores, and by the mosque it had a rauda, the sultans’ mausoleum. Texts from the 14th century indicate that nearby there was also a madrasa. The remains of two large sites point to the existence of further palaces: the Palace of Abencerrajes and a palace that subsequently became part of the Franciscan monastery. The upper part of the town was made up of a network of small industries, including kilns and water wheels for making ceramics and glass, a tannery, and a mint. Water was vital for the whole town and was drawn from the river almost four miles (six kilometers) upstream, reaching the Alhambra by means of a water pipe, the Acequia del Sultan. This became an aqueduct when it entered the walled area and ran downhill parallel to the street, then branched off into a network of pipelines, forming part of a complex hydraulic system that also regulated the water levels in the pools. Cisterns and public squares completed the cityscape, with the houses being reached by small streets, alleyways, and arcades. The largest houses served as homes for court officials and servants. The Partal (or Portico) Palace is the oldest palace in the Alhambra. It was probably built at the beginning of the 14th century, but all that remains from its original form are the large central pool and the five-arched portico that gave the palace its name. Two towers on the Medina section of the town wall illustrate what these houses may have looked like: the Torre de la Cautiva, or the Tower of the Captives, is one of the examples of the golden age of Nasrid art in the mid-14th century. Like the other houses, the main room was entered from a small patio with arches resting on pilasters behind a partitioned entrance area. Small, axial recesses with twin windows are let into the three outer walls. The most remarkable are the wonderfully shaped, multicolored alicatado dadoes, where the color purple is particularly striking, as it was rarely used in architectural ceramics. A frieze of inscriptions adds the finishing touch to the bases. Stucco panels cover the remaining sections of the walls. These were originally painted and gave the effect of wall hangings or carpets. Following the traditional scheme of residential architecture, the tower also has living rooms on the upper floor, and is topped with a terrace. The Torre de las Infantas was designed in a similar way, but was not built until the end of the 14th or beginning of the 15th century. Features of the building decoration, such as a cruder painting technique or more simple proportions, indicate the beginning of the decline in Nasrid art. The interior follows the traditional pattern, but the three main rooms are grouped around a roofed space with a fountain in the middle, and not around a patio. They give the effect of alcoves and have windows that open in the outer walls. The lantern structure was originally topped with a muqamas vault, but this was lost and replaced in the last century by an ornamental roof. In the upper floor, there is a gallery on two sides, and it opens onto the terrace. Interior view of the Torre de las Infantas. Roughly 30 towers of varying size and shape punctuate the outer wall of the Alhambra. In addition to the towers, which are an integral part of specific palaces, there are also so called palace towers, which differ from the others in their decor and building features. The Torre de las Infantas was built between 1392 and 1408, and comprises a roofed courtyard with various alcoves and adjoining apartments, which are arranged around it creating two stories. Palace of the Generalife. The Generalife includes not only seven vegetable gardens but also an elegant palace, similar to the Alhambra palaces in terms of construction and decoration. Here, too, an elongated patio with a water source forms the focal point around which the palace was built. Instead of the usual fountain, the Generalife has a canal, known as the Acequia, sur-rounded by gardens that gave the courtyard its name. Here, too, the ingenious hydrotechnology provides convincing evidence of the great significance and symbolism of water throughout Islamic cultures. The Nasrid sultans also had many estates to provide for them or where they could build outside the city walls of the Alhambra. Some of these lay in the area surrounding the palace district. By far the best preserved is the Generalife (jannat al-arifa), which is directly adjacent. In contrast to the past, the Generalife is now linked to the Alhambra by a series of gardens created in the first three decades of the 20th century and based on a free interpretation of the Spanish-Muslim garden. The “jannat prefix means “the gardens” in the comprehensive sense of the word as a place of vegetation, of cultivation. Surrounded by almost 500 acres (220 hectares) of meadowland, the four large vegetable gardens form the Generalife, which is dominated by a palace building with ornamental gardens. Most of the vegetable gardens are still cultivated today and so the site of the Generalife is also of major ecological and even anthropological, not just historical, significance. The central building in the Generalife displays the same architectonic structure as the Alhambra palaces: a patio with a water source — in this case part of the canal that used to irrigate the estate by means of four watercourses forms the central point of the residential buildings. The most elegant room lies on the northern side and opens onto the countryside via a mirador; or observation tower. The patio has coordinate axes inlaid with four large, lower-lying beds on the edge of the water channel, which is bordered by narrow paths. Despite the decidedly rural nature of this complex, which is particularly striking in the entrance courtyards, the building is decorated like a palace. It is embellished throughout with alicatado dadoes, stucco panels that covered the walls right up to the timber ceilings and roof struts, geometric decor, calligraphy, muqarnas and atauriques, marble columns, arches, and latticework, etc. The small mirador projecting from the patio is particularly remarkable with its magnificent view over the vegetable gardens and the Alhambra behind. Through many openings in the walls, windows, and open loggias, especially in the magnificent halls of the Alhambra, there is an unrestricted view direcdy onto the town of Granada situated at the foot of the hill. Generalife has for the most part survived, it has seen some changes over the centuries. Thus the baroque garden, for example, was laid out where the palace baths used to be. The garden with its many ornamental water fountains is now called the Patio de la Sultana. The Islamic town of Granada developed in the Darro valley in the period between the Zirid (11th century) and the Nasrid dynasties and looked out on the fertile landscape of the Vega. Some bridges, such as the Tableros bridge, and a few gates, including the Elvira, Monaita, and Bibrambla Gates, still survive from this period of the towns development. They formed landmarks along the town walls which rose up the hill of Cerro de San Miguel and which protected extensive cemeteries and large areas of the town, such as the Albaidn, the Realejo, and the Antequeruela. These parts of the town still reveal their medieval Islamic roots: the irregular layout of the streets, the emphasis, in town planning terms, on private as opposed to public spaces, and stark topographical contrasts. Some of the surviving buildings have retained their original appearance totally or partially intact. Examples are: the El Banuelo steam bath; a funduq (trade center with accommodation and warehouses), the Corral del Carb6n; schools such as Yusuf Is Madrasa; commercial areas such as the Alcaicerfa; mosques turned into Christian churches such as San Jos£, El Salvador, San Juan de los Reyes, or the Ermita de San Sebastian; palace buildings such as the Dar al-Horra, the Cuarto Real de Santo Domingo, the Alcazar Genii, the Casa de los Giornes; and Morisco houses such as the Casa de Zafra, the Case del Chapiz, or the Casa de Horno de Oro. Remains of the excellent water supply system, such as the Aynadamar canal and numerous cisterns in the Albaicin, have also survived. View of the El Albaicin district of Granada. Opposite the Alhambra, on its northern side, lies Granada’s other great medieval building complex: the Moorish quarter of El Albaicin. With its narrow, steep alleyways, whitewashed houses set at random, varying angles to each other, and tree-filled squares, this quarter has retained much of its character as a medieval Moorish settlement. The Albaicin was a place of refuge for the Moors driven out by the Christians from other parts of Andalusia. They occupied the district until 1568.The Alhambra and the Albaicin present an unusual unity of town and country, confirmed by UNESCO declaring them a World Heritage Site. Jesus Bermudez Lopez was born in 1959 in Granada and studies geography and history, also graduating from the Arabic-Islamic Department of the University of Granada in Semitic Philology. As a specialist in Islamic art and archeology, he was involved in the creation of the 'Special Plan for the Alhambra and Alijares'. He is a member of the Center for Historical studies on Granada and its Kingdom and honorary member of the Friends of the Alhambra cultural association. The still ornate islamic structural achievemnets, glowing on the face of the earth, are un-paralled! A wonderful review of one of my favorite places, a place of great beauty. Absolutely the most spectacular architectural and cultural experience I have ever had. Highly recommend this site!